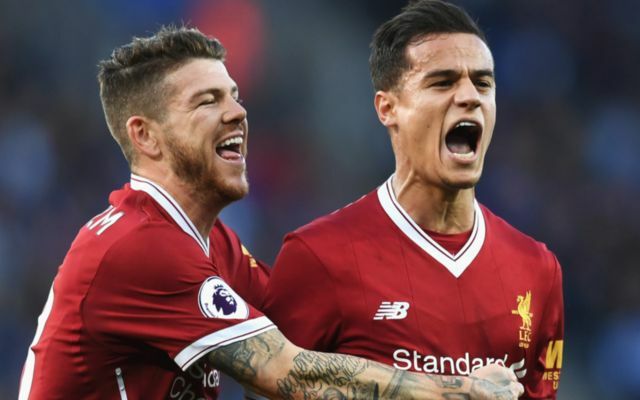 Liverpool midfielder Philippe Coutinho was the Man of the Match for the Reds, as Jurgen Klopp’s side scraped past Leicester 3-2 to climb up to 5th in the Premier League. Liverpool opened the scoring in the 15th minute, after Brazilian international Coutinho swung in a fantastic cross to back post, as the Egyptian towered his header towards goal, beating Foxes ‘keeper Schmeichel in the process. Liverpool the doubled their lead in the 23rd minute after Coutinho scored a contender for Goal of the Month, as the Brazilian slammed home a superb 28-yard free kick to double the away side’s lead. Leicester then clawed a goal back just before half time, as a Jamie Vardy header was missed by ‘keeper Simon Mignolet to allow Shinji Okazaki to tap in the rebound and half the home side’s deficit. There were questions from the Liverpool players about whether the goal should’ve stood, after they believed that Okazaki had fouled Mignolet in the build up to the goal, however referee Anthony Taylor waved away the protests. Liverpool then scored their third and final goal of the game in the 68th minute, after a fine counter-attack from the away side saw captain Jordan Henderson being put through before the England international placed his shot past Schmeichel to put the Reds two goals ahead of Craig Shakespeare’s side. Leicester then clawed another goal back immediately, after a shot from Demarai Gray was parried out by Mignolet, only for Vardy to head the ball into the empty net to ensure a nail-biting finish to the match. Leicester then had a golden chance to equalise just three minutes later, after Mignolet fouled Foxes forward Vardy, however the Belgian then made amends for his error, as the Reds shot-stopper made a smart save to deny Vardy from the spot to keep the away side ahead. Liverpool had a glorious chance to open the scoring 13th minutes into the match, after a 25-yard strike from Emre Can clattered the post, before Egyptian winger Salah placed his shot well-wide of the target with the goal at his mercy. Coutinho had chance to get his second of the game two minutes from time, after a ball from teammate Roberto Firmino was flashed across the box, however the Liverpool star failed to make any contact with the ball as is went behind for a goal kick. Leicester than had a somewhat clear penalty turned down by referee Taylor, after a ball from Gray seemed to have hit the hand of Can in the Liverpool box, however the appeals from the home side were waved away. For Leicester, they will be bitterly disappoined to leave the match this evening with a loss having missed a penalty in the second half. For Liverpool, this was a crucial win as the Reds had failed to win any of their three previous games in all competitions, with Jurgen Klopp’s side now firmly back in the title race following this victory.